If you’re going to move abroad by choice rather than for a job posting, it can seem overwhelming to view the sea of possibilities and narrow it down. The best countries to live in can vary a lot by person depending on what they like and don’t like. When it comes to a big decision about living abroad though, it’s best to take some time and do some real research. Maybe even get some help. I’ve got a book you can check out for answers, with some consulting options for those who need it. The following is an excerpt from that book, with a process on how to get your list of living abroad options on paper. There are three main criteria most pros and cons about a destination fall into. There are head items, which are factual “must-have” factors you can easily substantiate from the comfort of your sofa with a laptop or tablet in hand. Then there’s the question of “What can you afford?” That one’s pretty cut and dry, once you have good information on the cost of living expenses and setting up residency. If you’re barely pulling in $1,000 a month, that’s going to narrow down your options. Head to Cambodia, Nepal, or Nicaragua. If money is no object, you can pretty much ignore this part and just look at the head and heart items. Most people fall somewhere in the middle though. The heart factor is the hardest one to work out remotely. Sure, you can collect e-books, watch Travel Channel shows, check out YouTube videos, and join Facebook groups or message boards for that destination. Really though, none of those things will fully prepare you for how that place will make you feel. Let’s look at each factor on its own. Usually the answer is no for some very specific factual reasons — my head reasons. It’s too cold, too hot, too cloudy/rainy, too isolated, too overrun with gringos, too ugly, too unfriendly to pedestrians, and so on. For others, there may be no such thing as “too hot” or “too overrun with gringos,” They may think a steamy hot place where they can speak English every day with their fellow countrymen and women is perfecto. If you have health issues though, this may be the first place to start in narrowing down your choices. If you are allergic to mold, you may want to seek out a dry climate. If you have limited mobility, you don’t want to live in a city built on the side of a mountain. If you’re someone who just doesn’t want to die young, you’re probably not going to want to live in Beijing, where pollution levels are frequently 20 times the levels considered healthy and you can’t see more than two blocks away because of the smog. If you’re a retiree, you probably also don’t want to be in some remote location that’s a day’s drive from the nearest decent hospital. In almost any area where you find lots of people in your age bracket, there will be at least one good medical facility in town and many other larger ones you can get to in a couple hours or less. What’s on your checklist? Think about climate, culture, food, air connectivity, land connectivity, and apartment/house options. What’s a deal breaker? “If it doesn’t feel right, move on. We had planned to live in Panama for six months, but after 13 days we left and were in Costa Rica. When we wrote about our feelings on the blog, we got a lot of negative feedback and people saying, ‘You need to give it a chance.’ But we did give it a chance. We went to five different locations and compared to Thailand where we fell in love, Panama was a big disappointment.” It wasn’t right for them, so they moved on. For someone else, it may be just right. While you may be dreaming of retiring on the Amalfi Coast of Italy, on the beach in the Virgin Islands, or in a nice slopeside chalet in Switzerland, your bank account might not agree with those plans. You need to find a way to combine your checklist of ideal factors with places you can actually afford. If you picture yourself in a lakeside cottage looking up at jagged snow-capped mountains, you don’t have to spend $100,000 a year in Switzerland. You can move south of Bariloche in Argentina and live for one-fifth that amount instead. If you want to be on a warm-water beach with hot weather, there are 100 choices in Latin America and Southeast Asia that are a fraction of the cost of a Caribbean Island residence. For most of the cheapest places to retire, a pair of retirees living off two social security checks or an equivalent pension can get by just fine. In some countries, if you earn $1,500 for one person, $2.400 for two, you’ll be living on far more than the average middle-class local. That may not sound like a lot where you live now, but it will be double, triple, or quadruple what’s considered a good local salary. (This is why it’s hard to work overseas in an inexpensive country with a physical local job and still support yourself.) If you’ve got more than two social security checks coming in, you can be choosier about where to go and can upgrade your living standards. Keep in mind though that there are major variations within a country, especially a big country like Mexico. The more expatriates there are in an area, the higher the prices will probably be: witness San Miguel de Allende. The more of a tourist destination it is, the higher prices will be: witness Los Cabos. Other colonial towns in Mexico can be some of the cheapest places to live in the world though, with dollar beers and $1.50 tortas. Also, just because you can live on $1,500 a month doesn’t mean the government thinks that’s enough wealth to grant you permanent residency. In Nicaragua a retiree only has to show monthly income of $600 a month, but in Mexico you have to show $2,000 for you and another $500 for each dependent to get residency. There are ways around this sometimes if you can show other assets or finagle a work permit, but do keep these restrictions in mind before making big plans. The authors of Freakonomics and Think Like a Freak do a regular podcast on NPR and in one episode they answered a listener’s question about how an economist would pick the perfect place to live. Stephen Leavitt said some of his most important factors — what economists would call “amenities” — were access to golf courses, fast food drive-throughs, and houses with big yards. He didn’t care much about museums and cultural activities, but he could never live in a place without easy access to a golf course. In other words, he was meant to live in the suburbs, and specifically an American-style suburb. Steve Dubner lives in New York City and said his most important factors in where to live were the density of ideas, people, and creativity–and the resulting spillover effect. Without being in a big city where people interact a lot, he wouldn’t get any of that. “I could never live in a place without a good diner,” he added. In the end, they decided that choosing where to live was only an economic decision when it came to finding a place with the right amenities: childless couples don’t care about schools, but for parents it may be #1. Otherwise, it’s a decision you make with your heart. Most “heart” factors can vary a lot even between couples who are on the same page in most other attitudes and ideals. The cheapest country to live in may feel “just perfect” to one of them, while feeling like “a total s#*thole” to the other. As you can imagine, this can be the beginning of the end if they ignore these differences and try to plow forward. For couples, talk out loud when you’re traveling about why a travel destination would also be a good place to live and why it wouldn’t. The time to argue about what’s important is before you move overseas, not after. Then go do a trial run to see if what looked good on paper really pans out in person. There’s lots of info in the book about how to do that right so you’ll know for sure if it’s where to live or not. 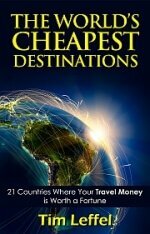 See how other expats are living a half price life abroad on the Cheap Living Abroad site. I’ve been in several places in Colombia for two months now. The weather is good, people are friendly, infrastructure not bad, scenery beautiful. Cost of living very reasonable. But there’s very little English spoken here. My wife is very sociable so we’re going to look at Belize or maybe Playa del Carmen. Hotter than I like, more expensive, but we’re just more comfortable with a certain level of English spoken. And she’ll never want to be too far from the kids, especially when she becomes a grandma. So cheap corners of Europe are out. Asia not even on the radar. That may be the fourth consideration, that everyone is on the same page to make it work. Walet factor: If you’re going to live abroad even in the short term, and absolutely in the long term, check out your chosen country’s income tax system. One big issue that’s usually not mentioned is that all places change, some much faster than others and in more radical ways. While you may love a town the way it is now, you may not like what it has become 3 – 5 years down the road. So, it’s a good idea to factor in change. Is Nicaragua safe these day? My wife and I are seriously looking at buying a small property on an island in the Philippines, where we can build and run a guesthouse. We are very excited about the coming adventure and would like to connect with other like-minded folks doing a similar gig. Since I’m not great with languages – it’s not going to happen – a 5 year old has way more social status and acceptance than I. Realize the honeymoon is over sooner than soon. Then reality’s the kicker. Again it’s all in the social space acceptance love ?? and feelings of acceptance or belonging or some compassion and mystical other life worldly things. Look for astrocartograhy and play with it. Also – if your focus is on work as a digital nomad than the focus isn’t on love ?? or family or long lasting social status – connections. Thank you for your sobering opinions, WB! I am the same type of personality like you. I also check astro.com – the travel map – regularly. SouthEast Asia is my favorite, but retiring there is a large step, as you say. Sarawak, Malaysia, has a very liberal policy for getting temporary residence (for up to 10 years, according to “Malaysia – My Second Home” program).